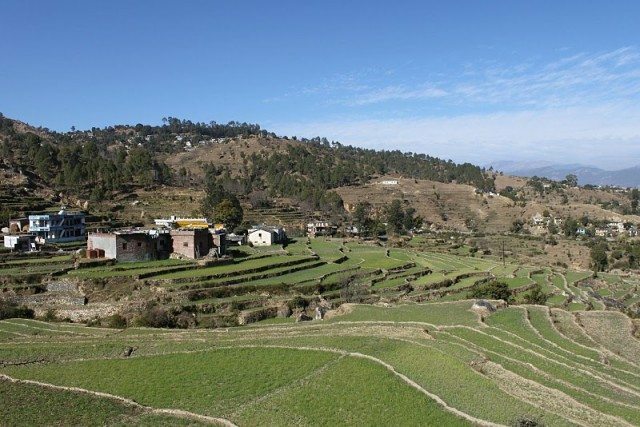 Braving the chill – Gwaldam, Uttarakhand - Ghumakkar - Inspiring travel experiences. This one has taken a bit long to come out. We did this ride in December 2010, but I didn’t get time to work on the log in the next few months (blame it on a hectic job). Six months passed by and in June 2011, we embarked on another ride. And circumstances took an unexpected turn to allow me some leisure to work on the travelogue. But before I focused on the new ride, I thought of giving the Gwaldam ride its due exposure. 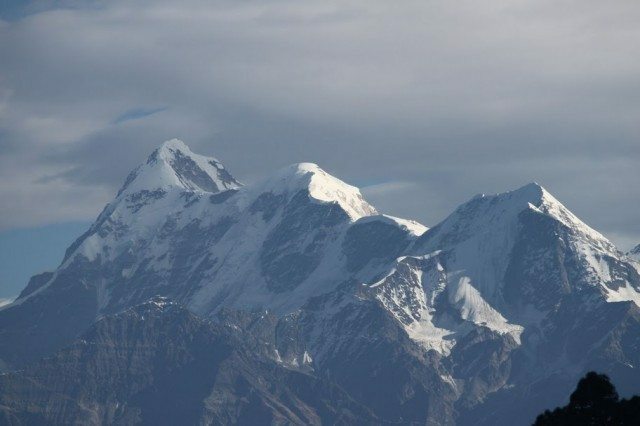 So, here’s a descriptive photo log on our journey to this breathtakingly beautiful destination in Uttarakhand. 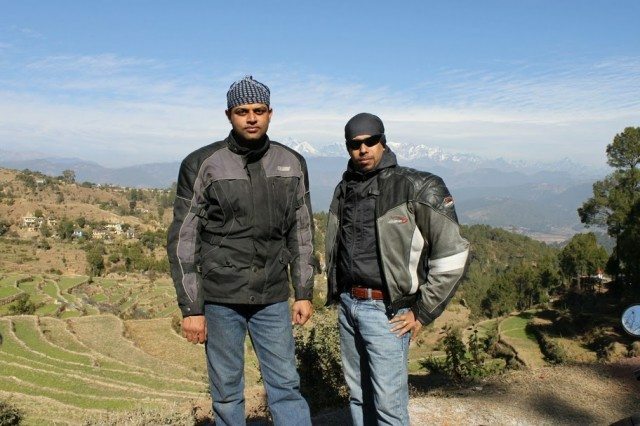 Paahji (Vishal Chopra) and I were joined on this ride by Sonu (Deepak Rawat), Paahji’s brother-in-law. 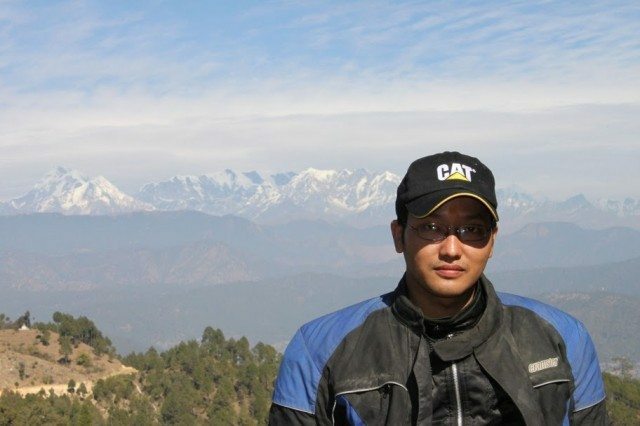 He rides a black Electra 4S and has a ride to Leh to his credit. As is our custom now, we started off on the eve of the first day to give ourselves that extra bit of time especially as it was winter. The ride up to Moradabad was uneventful and brisk. We halted for the night in a hotel opposite to the railway station and spent the evening in high spirits. No photos. Started off nice and early and took the Bazpur-Tanda route to Nainital. We had traveled on this route earlier so didn’t feel the need of taking current feedback and duly paid the price for it. We were very lucky to make our way through that wonderfully horrible road and a worse truck jam. Wish we could photograph the most horrible stretches but could only manage to click a few after crossing the worst part. 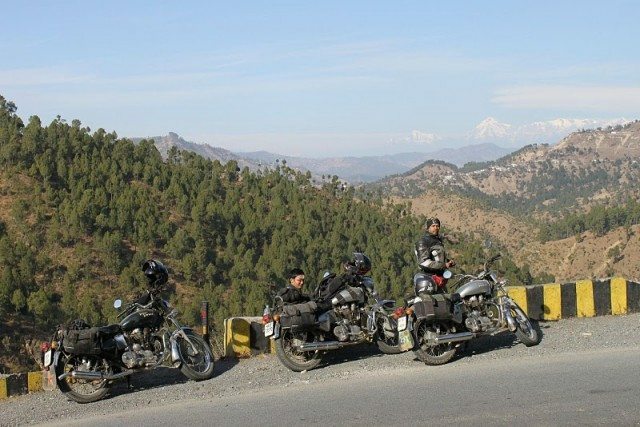 That stretch ate up a lot of time so we focused on reaching Nainital without fooling around further. 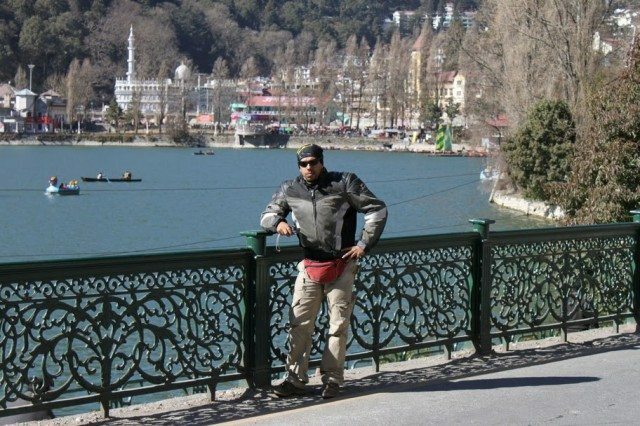 Nainital looked awesome in prime winter. It was bright, windy, and cold. Just a few photos and we left for Almora. Fueled up at Bhowali and it was already 12 PM. Right after Khairna, we again hit a bad patch of road. At many places, the road was badly impacted by monsoon rains. Development work was on but it was going to take time. We stopped close to Almora and had some packed food for lunch. 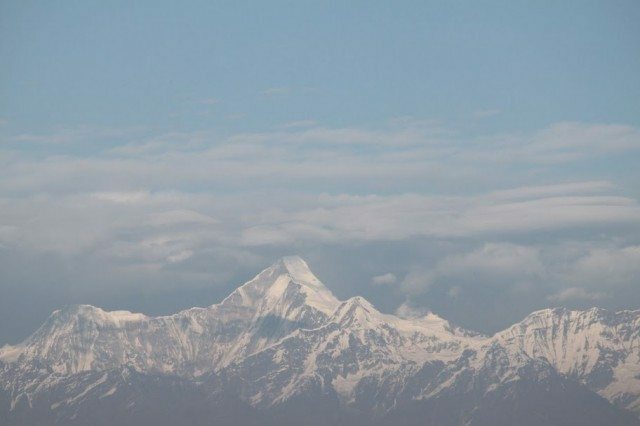 The snowy Himalayan peaks were visible from that point. The bad road delayed us further and by the time we hit Almora, it was 3 PM. We wasted no time and headed for Kausani. The road from that point was pretty good; still it took 3 hours to cover the 50 kms. The sun had set by that time and we were still 45 kms adrift of Gwaldam. 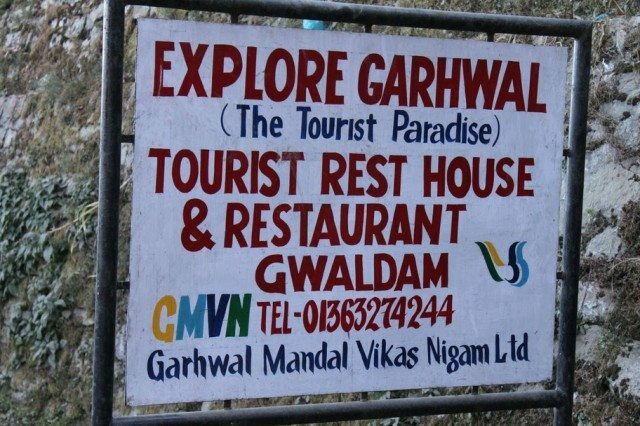 Paahji called up the tourist bungalow in Gwaldam to check availability of rooms. Those guys advised us against Gwaldam considering the cold and the darkness. But stopping short of the day’s target was not easy to accept. We unanimously decided to proceed to Gwaldam. It was a calculated risk that paid off. The road was reasonably good and we rode closely like a train to ensure safety. It got colder and colder as we gained altitude. We hit Gwaldam in 2 hours. Lights were out in that quiet little place but we managed to locate the GMVN tourist bungalow. 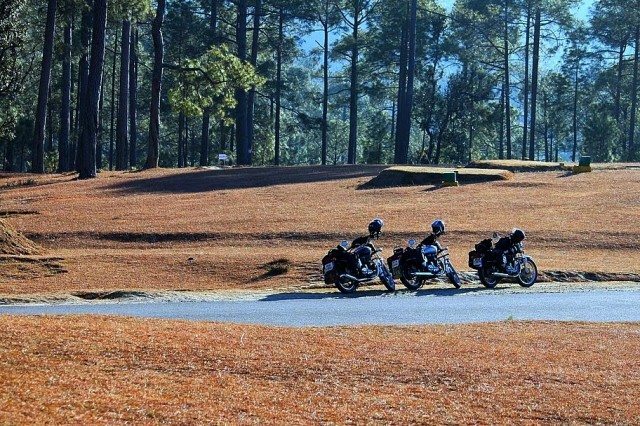 The guys at the bungalow were amused to see 3 crazy bikers from Delhi reaching such a remote hill station in sub-zero temperature. We had a delicious mutton curry from the only dhaba available nearby, drank rum to our limits, and enjoyed the bone shaking cold. Woke up to a bright morning in Gwaldam. It was still freezing cold. The guys at the dhaba below were enjoying a fire. Paahji joined in. 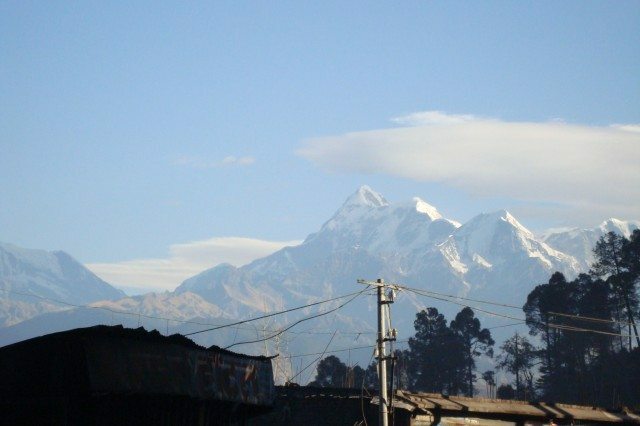 Gwaldam’s proximity to the great Himalayan peaks is astonishing. We went on to photograph the mesmerizing snow clad peaks in bright sunshine. The plan for the day was flexible. 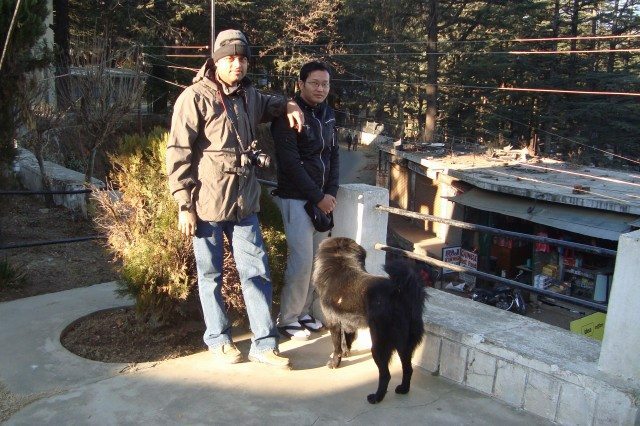 We could chose from a few options like going back to Ranikhet and from there to Binsar; or we could go back to Nainital. Considering the cold weather, we decided to halt for the night at a place reasonably close to the plains. 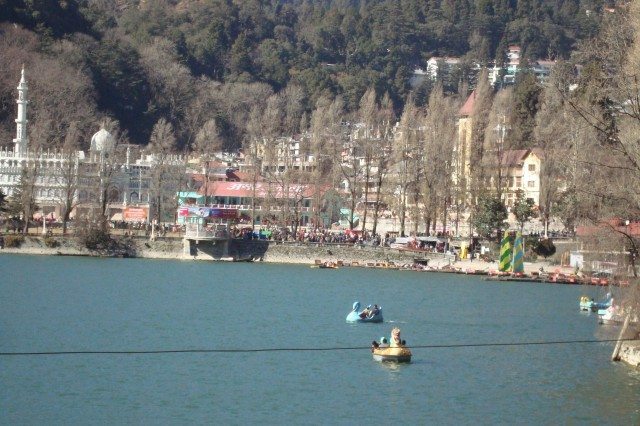 I suggested Bhimtal, as Paahji or Sonu hadn’t been there before. 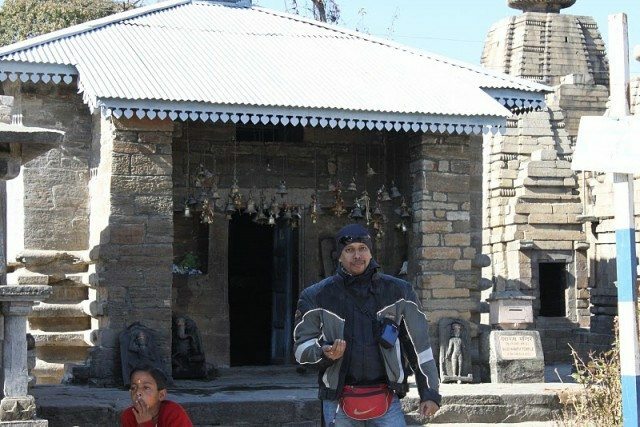 We left Gwaldam at around 10 AM and headed for Baijnath dham. 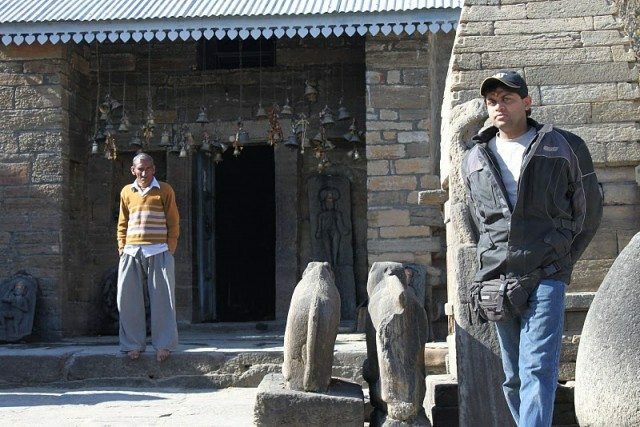 We encountered a phenomenon called Bhimshila at Baijnath. 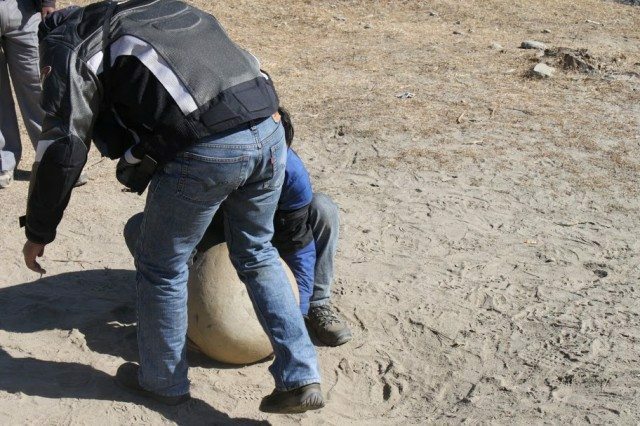 It’s an unassuming round rock likely to weigh not more than 60-70 kgs. 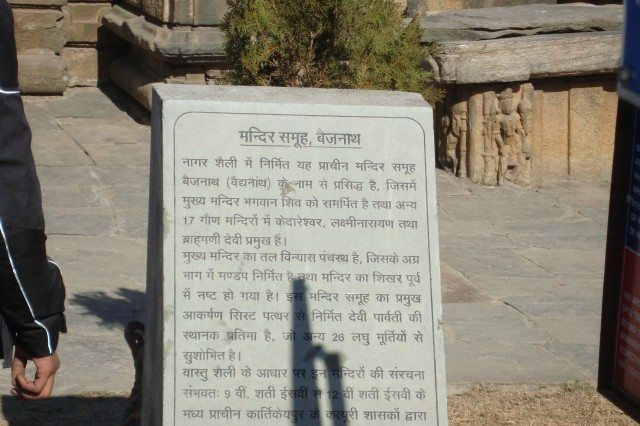 The myth is that the second Pandava, Bhim, put his foot on this rock and from that contact, the rock acquired spiritual attributes. 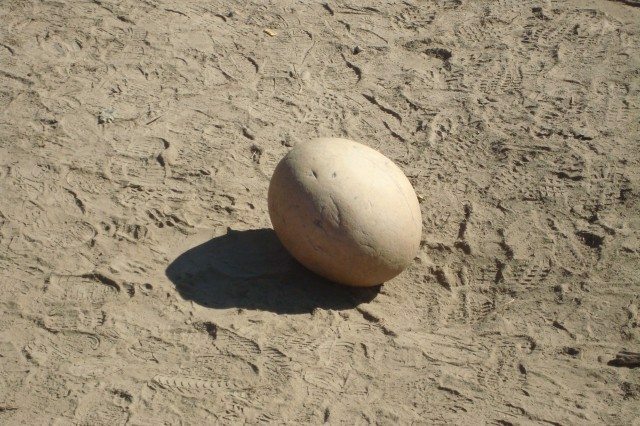 This rock cannot be disjointed from the ground by applying any amount of human or mechanical force. It can only be rolled from one place to another. The temple high priest told us that the Bhimshila can be lifted off the ground only by using nine single fingers and chanting the number ‘9’ in unison. 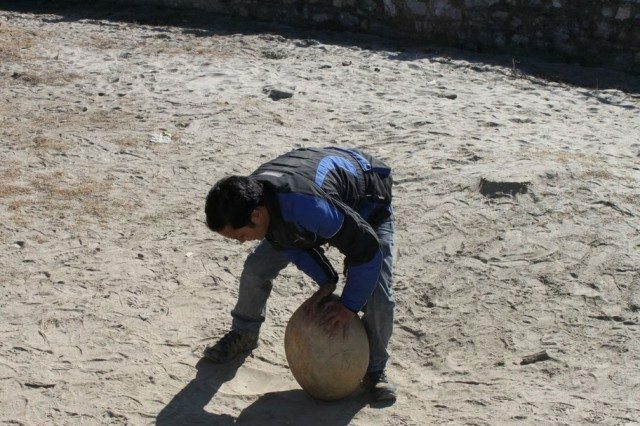 Our natural reaction was of disbelief and Sonu decided to have a go at lifting it. Seeing Sonu struggle, I joined in. We may not be the weightlifter type, but together Sonu and I are well capable of lifting more than 100 kgs. The rock couldn’t be lifted. It felt like it was bolted to the ground but strangely, it could be rolled easily from one place to another. The high priest smiled at our embarrassed looks and called Paahji and one more guy to join hands. Together we put nine fingers under the rock and chanted ‘9-9-9-……’ and stood up slowly. The rock came up with us up to waste height. We were speechless as our logical thinking failed to justify what had just happened. Apparently, the Discovery channel also tried to unravel the mystery surrounding the Bhimshila, but was left equally flabbergasted. 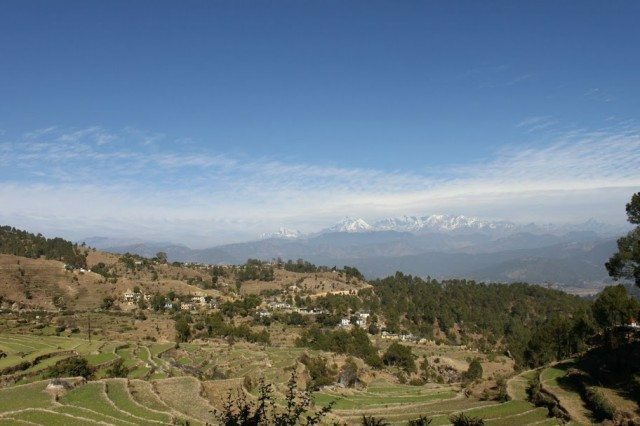 After having a great time around the picturesque settings of Baijnath and clicking lots of lovely photographs, we made a move for Ranikhet. The road continued to be wonderful. We lunched at Ranikhet in a decent vegetarian dhaba. 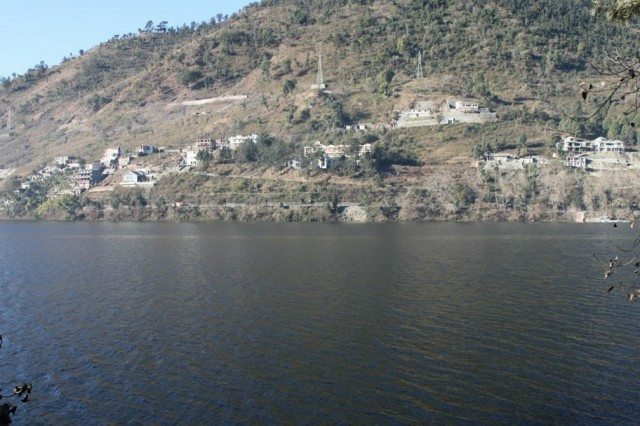 Bhimtal was about 50 kms from there. 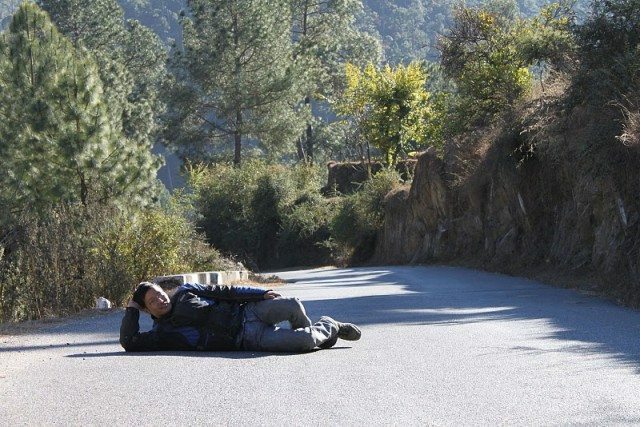 We took the wonderfully laid out Ranikhet-Khairna road towards Bhowali. For want of time, we didn’t stop to photograph that road. We just enjoyed a silken smooth ride for about 30 odd kms. By the time we reached Bhimtal, it was pitch dark. The huge lake looked intimidating even in the dark but the place looked as deserted as a graveyard. Paahji didn’t look too happy; he probably was expecting something similar to Nainital. We secured a nice room in a hotel to spend the night. 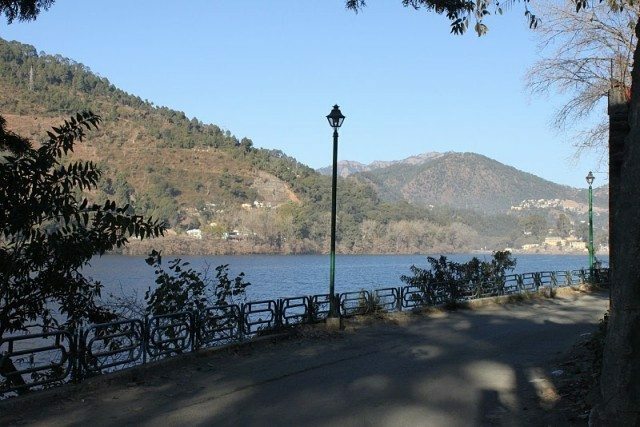 Bhimtal wasn’t happening at that time of the year. After a couple of quick photographs, we made an early start for Delhi. The Haldwani-Moradabad road is currently in excellent shape. 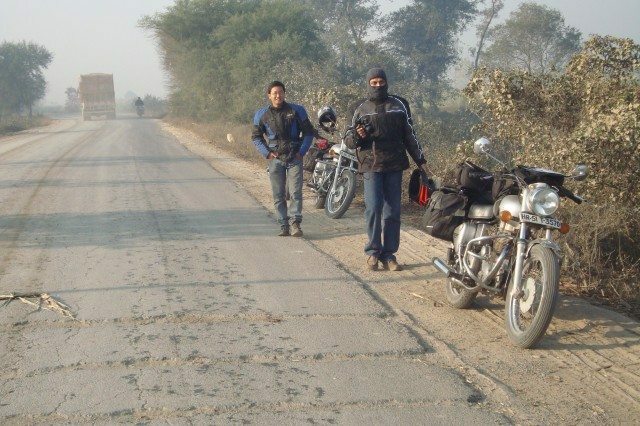 We made good time till Moradabad and then the Moradabad by-pass made riding even better. Made it back to Delhi comfortably by 5 PM. Devbhumi Uttarakhand really lives up to its name. Wherever you go it’s absolutely magical. 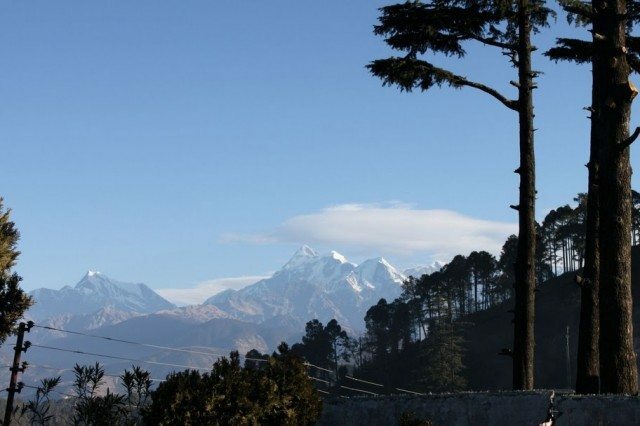 The Tals along with Ranikhet and Kausani are revered destinations in Uttarakhand. But the slightly lesser known centers are more pristine and soothing. 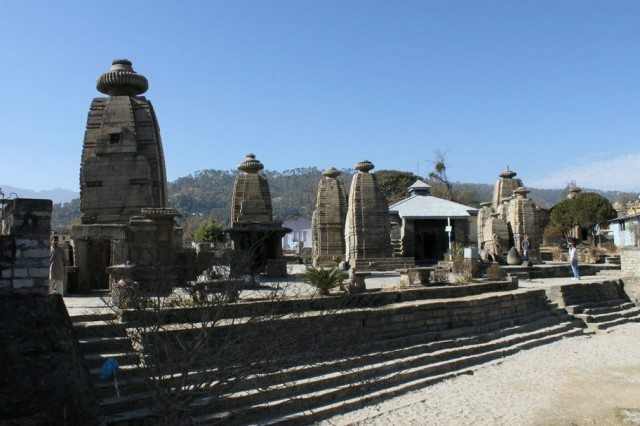 Places like Gwaldam or Baijnath will not disappoint the common tourist who is brave enough to go slightly off the beaten track. 1. 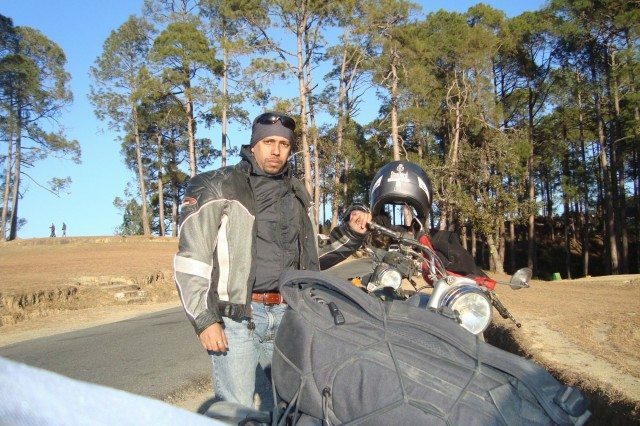 Vishal Chopra on his 2005 silver Electra 4S. 2. Anandarup Nandi on his 2007 silver Electra 4S. 3. 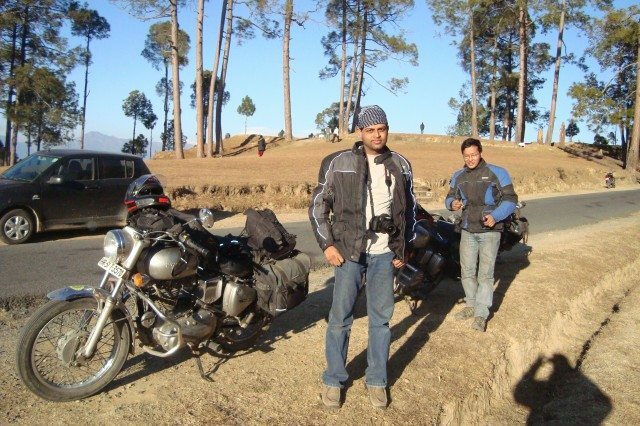 Deepak Rawat on his 2009 black Electra 4S. Hey Nandi – Long time. I am yet to read the story but did some housekeeping stuff (like adding ‘more’ tag, so that only an excerpt is displayed at home page) and would fix the rest later (adding the right categories, map info). Our editor would reach out to you sharing all the details and most importantly about ‘timing your stories right’ so that you get at least a clean 12 hour windows on top of home page. Hi Nandan, things are getting bigger and better at ghumakkar it seems. The homepage and photo display are looking much better. I am also glad to be back. Working on another log. Will be sharing shortly. Please share the valuable info. This whirlwind trip of yours is really impressive. I was in this area during Mar-Apr, and then again in May this year, and believe me, I would have taken at least double the time to cover the expansive area. Great. Bhimshila description is amazing. Does it really happen that way? Is the utterance ‘9’ in Hindi (nau)? Did you try the finger- exercise while uttering some other monosyllable word/ and or without uttering anything at all? Hard to believe this beyond logic phenomenon. Thanks Auro. It was indeed in hindi (nau) and we didn’t have time enough to try different things. At one point, we felt that whatever it was it needed to be respected. Wonder of nature may be!! 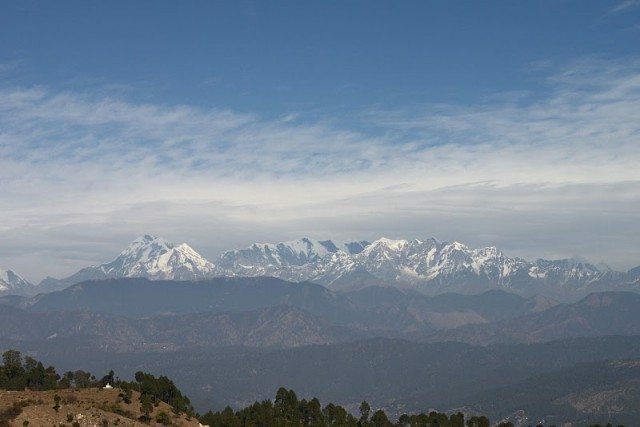 Being a lover of Kumaon Hills (been there thrice during the last six months), I really get excited on the very mention of places like Kausani, Baijnath, Gwaldham, etc. Your brilliant write up, supported by some excellent pics, has created an urge to visit these places soonest. Hats off to your effort of driving through the hills in December, when the day temperature is in the vicinity of 5-8 degrees. Thanks Ram. It’s difficult not to fall in love with Uttarakhand. This was my 6th visit and third on my bullet. Luck permitting, I’ll go many more times. @ Nandi—- Nice to see your post after a long time. 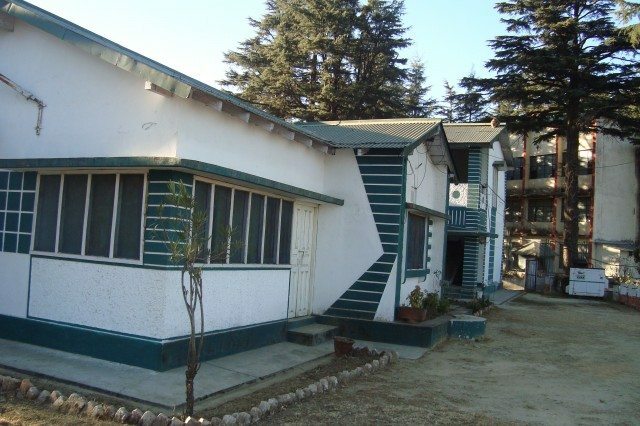 Visiting a hill station in winter has its own charm. @ Auro Dada — Uttranchal is full of surprises , story related to Bhimshiela is very much true. Yeah Mahesh, I was away for some time. It’s nice to be back. @ Mahesh, surprise – Yes. But… OK, Bhimshila its on agenda (perhaps like so many other places described by Ghumakkars…whetting our desires to see more and more of it). Your thrust for uttaranchal increases after every visit to place. So now I read it :-). True Bikers, just keep riding. I have a similar feeling as Auro about covering so much in so few days. 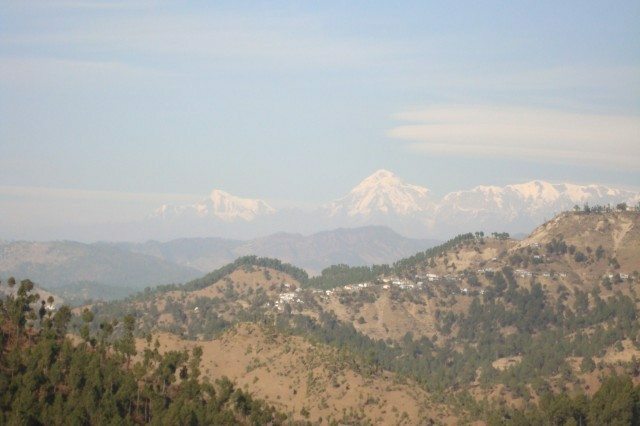 The views from Kausani and Ranikhet are really amazing if you go in the right weather. AMAZING is all that I can say! And I am keen to DO it. Can’t agree more with Nandan regarding Ranikhet and Kausani. In the right weather, these places can be absolutely magical. 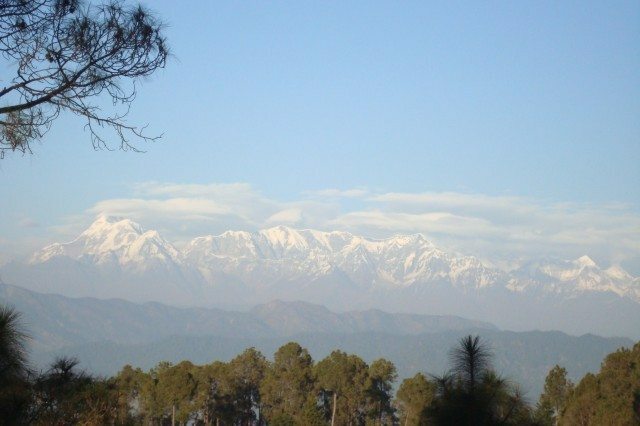 A few years back, I spent an evening in Kausani watching the sunset. Never again did I see a better spectacle than that. Love the engaging description and the pictures. And, of course, Bhimshila is spectacular. There are so many miracles all around us, and yet we choose to be agnostics. Be it science or God, there is some power out there that we don’t completely understand. Very humbling. ?????? ?? ?, ?????? ?, ??????? ?????????? ?? ???????? ? ???? ?? ???????????? ?????? ?? ????? ????? ?? ???? ???? ???????? 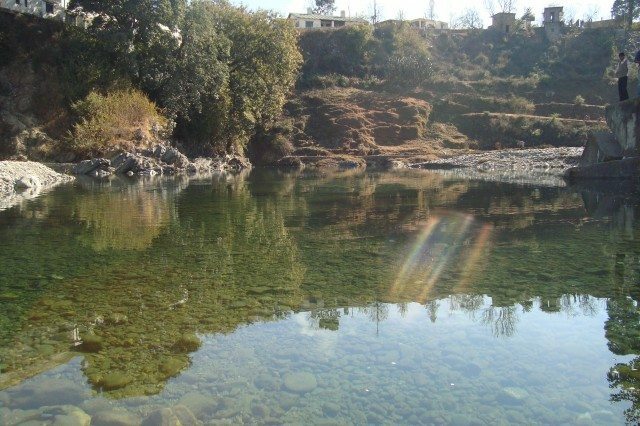 Interesting to know about Bhimshila..
Uttrakhand is really beautiful and much to explore. I am reading this post today 21December 2016.Almost six years after these three ghumakkars wrote the enchanting piece. Very good narration. Maza Aa Gaya! 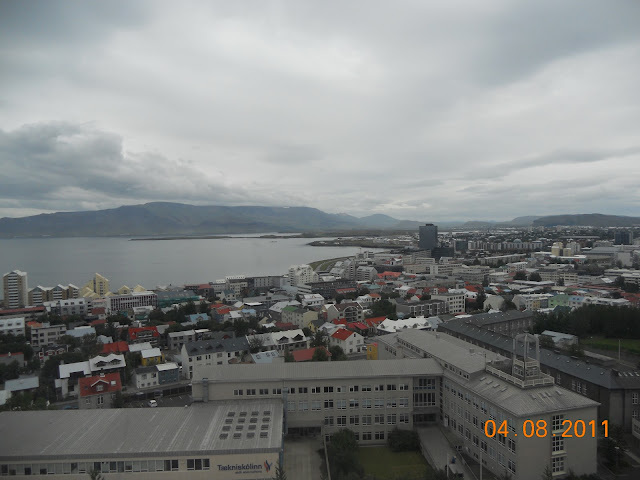 Reykjavik is a small city having a total population around 120,000. There are very few foreigners here and Indians are hard to find. There are a few Indian families and 10 students in Iceland University. Reykjavik is on the North Atlantic sea. Since the warm gulf stream traverses nearby Reykjavik, the climate of Reykjavik is never harsh. A maximum of 15/16 degrees in summers and around -5/-6 in winters. Some days may see temperature as low as -16C but these are rare. We enjoy 6 months of day and 6 months of night here. Another interesting point is that every other Icelanders vows to have met a ghost or troll or an elve. There are certain places around Reykjavik known for such entities. I have yet to meet one ! !